A amplification modeller is an digital simulation of a guitar amplifier. An amp modeller can be run in hardware (like a Line 6 POD) or in software as a VST plugin for a DAW. Popular amp sim TSE X50 becomes a paid product and is released in a completely new version with integrated overdrive, cab loader and guitar effects rack. Positive Grid are releasing a custom virtual amp builder that lets you change just about everything and use the amp right away in JamUp. Audio latency can ruin your home studio and recording experience – here’s how to make it go away, with specific tips for Reaper. With no bassist and no bass guitar, you can still make bass tracks for your songs using a plugin in your DAW. Learn how to apply the mixing tips in the Systematic Mixing Guide bass chapter to a bass plugin to get a great bass tone. 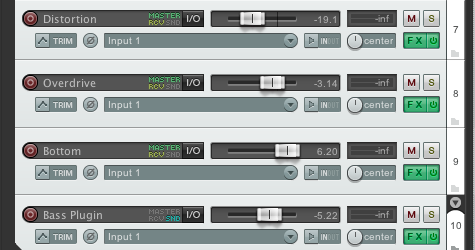 The LePou plugins are probably the most popular amp sim plug-ins around. The sound quality is awesome and they behave exactly like their physical counterparts, and furthermore they are free. They were just released in 64-bit versions for all platforms, and the impulse loader LeCab2 is now available for Mac. The JamUp iOS amp sim is recognized as one of the best, if not the best. Here’s a video where Jeff Loomis and Keith Merrow show what it’s really capable of! The Kemper profiling amp can emulate any physical amp and cab, and very well at that according to skilled people who have tried it. Now Kemper is releasing new versions of their amp – a rack mounted version and one with a built-in power amp. Audiobus is a revolutionary app for iOS that lets you chain multiple audio apps. Select one app for input, route it through multiple apps processing the signal on its way to say a multitrack recording app serving as the output.